In Richmond, the fight against crude by rail is the latest example of the fossil fuel industry’s blatant disregard for the climate and the health and safety of communities of color. We know we don’t need this toxic and explosive extreme oil - already, our communities are building solutions for climate resilience and social justice. Together, we demand an end to extreme fossil fuels as we usher in a just transition to a clean, equitable, and thriving economy for all. This summer, the fight against oil trains is heating up across the Bay Area, California, and North America. Richmond is on the front lines of two major oil train fights: first, environmental justice leaders have been fighting to shut down the illegal Kinder Morgan oil trains terminal, which was permitted behind the backs of the community. In addition, the proposed Phillips 66 oil trains terminal in San Luis Obispo County would bring an additional 2.5 million gallons of toxic, explosive tar sands oil daily through the city. Already, the climate justice movement in Richmond and beyond have been stepping up to fight both projects. Now is the time to turn up the heat. This July marks both the height of the Summer of Our Power and the second annual Stop Oil Trains Week of Action that commemorates the second anniversary of the tragic Lac-Mégantic, Quebec, oil train catastrophe that killed 47 people. 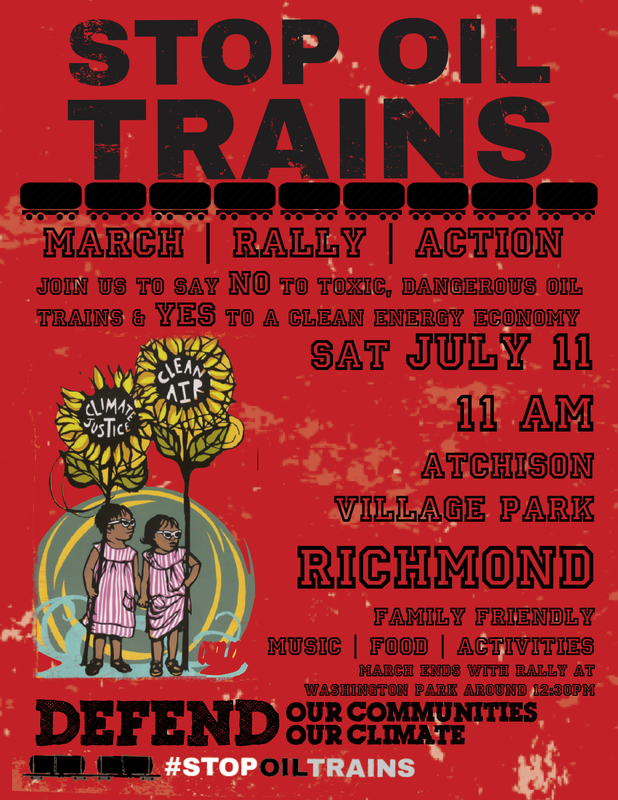 That's why On Saturday, July 11th, a coalition of environmental justice, labor, climate, and community groups will mobilize thousands of people to stop oil trains in Richmond, as part of the Summer of Our Power and the national Stop Oil Trains Week of Action.